The district of Kissamos covers the north-west corner of the island of Crete. It is one of the least developed in terms of tourism and combines rugged, almost deserted land (as on the peninsulas of Gramvoussa and Rodopou) and rolling hills covered in olive trees. It also boasts some fine beaches, such as Falassarna on the west coast. The region is connected to the rest of Crete by the coastal road which runs to the north of the island. There is a regular bus service from Chania. The town of Kastelli also has a rather sporadic boat service to the Peloponnese. Visiting the region will however require you to hire a car or taxis unless you have the time to wait for the occasional public bus. The ruins of the ancient city of Polyrinnia lie 7 km south of Kastelli, above the village of Ano Paleokastro. The hill on which the ruins are located is steep but the views are superb. The city was founded by the Dorians in the 6th century and was constantly at war with the Kydonians of Chania. Later, under Roman occupation, Polyrinnia became the best fortified city of Crete and the administrative centre of western Crete through to the Byzantine period. It was reoccupied by the Venetians who used it as a fortress. Many of the ruined structures date from the Roman period and include and aqueduct built by Hadrian. The most impressive structure is the acropolis built by the Byzantine. The barren peninsula of Rodopou only has a few villages clustered at its base and the rest of it is uninhabited. A paved road goes as far as Afrata, then becomes a dirt track which heads north. It is possible to reach the Diktynna Sanctuary at the northern end of the peninsula with a 4x4 vehicle. This was the most important religious sanctuary in the region under the Romans. The Gramvoussa peninsula is wild and remote but there is now a good track following its eastern all the way to its northern tip. 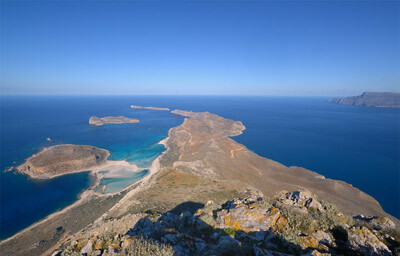 From there you need only a few minutes on foot to go down to the beautiful beach of Tigani to Balos. White sand and turquoise waters give it a South Seas appearance. Out to sea you can see the islands of Gramvoussa with their large Venetian fortress. Gramvoussa could be paradise but unfortunately, there is often quite a bit of tar on the beach and the increasing number of visitors (now that you do not need to walk for hours) are creating a bit of a rubbish problem as well. Still, it is worth the long drive, if only for the superb view that you get at the end. Falassarna is located 16 km west of Kastelli and is best known for its fine sandy beach and crystal clear waters. Apart from a few tavernas and small hotels it is rather deserted but was occupied since at least the 6th century BC. Although it was built next to the sea you will see that the towns ruins are about 300m away from the water because the western coast of Crete has risen substantially in the past 2000 years. Falassarna used to be the west coast harbour for Polyrinnia (the other one being Kastelli) but later became Polyrinnia's chief rival and there are plenty of ruins and excavations to be seen. Ennia Horia (the nine villages) is the name given to the scenic mountainous region south of Kastelli. It is renowned for its chestnut trees. 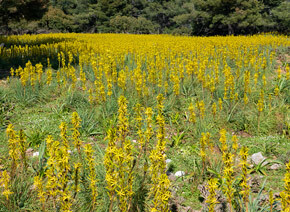 Most people drive through the region on their way to Elafonisi but it is worth stopping on the way to admire what is probably one of the lushest areas of Crete. It comprises the villages of Topolia, Koutsomados, Vlatos, Elos, Pervolia, Papadiana, Amidagakofelli and Kambos but the best known village is probably Milia which was reconstructed in traditional style with financial help from the European Community. The rebuilt stone houses can be rented and are ideal if you are looking for isolation in a lovely mountain setting. For more information about the region you can take a look at The Cretan guide to living in North Western Crete. Kissamos News is a good source of news about activities and events in the region.